Godfrey Sanga – personal webpage – Hi, welcome to personal webpage of Godfrey Sanga, energy projects and business development consultant. Views expressed in this website don't necessarily reflect those of my clients. Productive use of electricity or productive end-uses of electricity (PUE) were buzzwords in the energy access sub-sector even ten years ago. While working at TaTEDO I was involved in building “Sustainable Energy and Enterprises Centres” (SEECE) and Multifunctional Platforms (MFPs). SEECE is a 1 or 2 containers housing different enterprises that are powered by solar PV such as phone charging, juice processing, butchery, barber shop, hair salon, tailoring, computer and secretarial services. In 2010 I wrote an article about SEECE as a potential driver for new market for solar PV in Tanzania which was looking at potential increase in the demand for solar panels from PUE applications. MFP comprise of a diesel/biofuel powered engine that is connected to machines such as maize mill, dehusker and oil extractor as well as a generator for electricity production. Most of the MFP were of 9kW to 25kW capacity and could be connected to an electricity distribution network sufficient to power 100 to 200 households in rural areas. PUE is even more important today for both energy access and stimulating rural economic development and improving viability of rural electrification projects on-grid and off-grid. As a basic principle though, success of PUE activities depends the presence of demand for the products offered, just like in any other business; investments in PUE should generate profits in order for it to be successful and sustainable. the price of solar panels is much lower now, the PV Magazine reported that the current prices are in the $0.27-$0.37 per Watt range reduced from about $3.4/Wp in 2007. This reduction in price has lowered the costs of electricity generation using solar PV since the cost of panels usually makes approximately 50% of the total cost of the solar power generation plant. Increased support to entrepreneurship and business development by organizations such as Energy 4 Impact and TaTEDO facilitated by improvements in road infrastructure, communications, incomes and ease of flow of money from urban to rural areas and vice versa through mobile money. The major challenges facing the PUE entrepreneurs are high tariff of electricity, especially to those connected to isolated mini-grids, access to suitable appliances/equipment and smaller markets for their products in rural areas. A project supporting production of a new and/or high value products such as packed maize flour and timber should also include facilitating access to distant markets outside the villages in order to make the project successful. On the other end, the mini-grid operators and other players in the market can facilitate to access efficient, affordable and reliable appliances and equipment extending distribution chains of appliances, aftersales and financing services beyond large towns. More and more energy generation and distribution companies such as mini-grid owners and operators are likely invest in PUE assets themselves to benefit from the potential business opportunities in the target markets. The energy companies intending to do this should have expertise and capital to invest and operate other businesses different from generation and selling of electricity. I am very pleased with our Sunking Home 60, 2 years after we started using it. 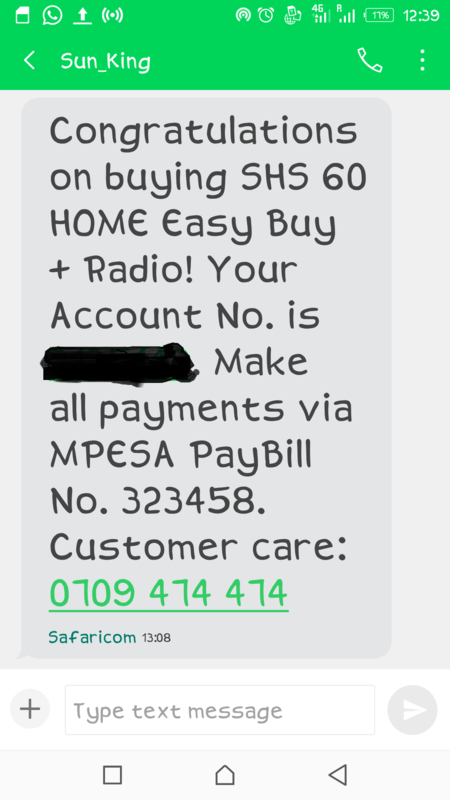 I completed repayments sometime back in 2018 and now 100% owner of the system. Today I would like to talk about our experience with the two LED indicators on the “Energy Hub” that we found to be very useful in this product. On the left hand side of the Hub is the LED scale to indicate strength of sunshine on the surface of the solar panel. In order to achieve fast charging the indicator should be on the topmost position, bar no 5 from the bottom. This is what guides us in placing the solar panel every time we want to charge the Hub. Everyone at home knows the spots in house where the panel can receive the maximum sunshine. This product design allows user to move the panel to different locations in the house, thanks to the 5 meters long cable connecting the solar panel and the Hub and the possibility to move the Hub if disconnected from the loads i.e. the lights and others that have been connected on the 12V DC outputs. With this meter we can avoid mistakes of placing the panel where there is no enough sunshine which is the main cause of slow charging of the Hub. On the right hand side is the battery charge which indicates the amount of energy available in the battery. At full charge capacity, top most level, this Hub keeps 6,000 mAh of energy. The two intuitive meters are very useful to avoid users mistakes and maximize performance of the system and increasing users satisfaction. With the meters it means we can avoid slow charging as a result of wrong placement of the solar panel and over-discharging battery in the Hub. These are the most common problems that causes users dissatisfaction from my experience of using many solar lanterns and home systems. 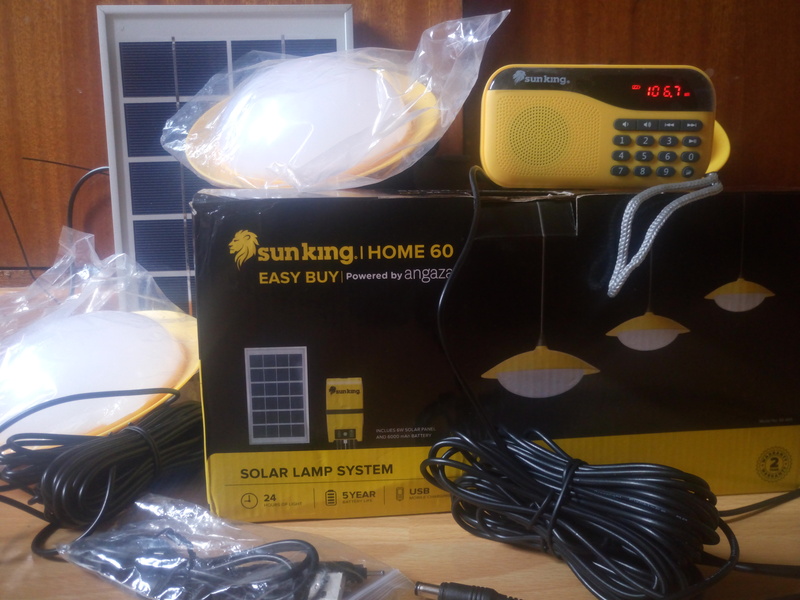 In addition to the Sunking Home 60, we also have a collection of other solar lanterns and radios that I purchased for use and others that I received for reviewing. Apart from the direct benefits of good quality light, phone charging and radio, my daughter (10 years) and son (8) can confidently explain how solar technology works which I think is a wealthy of knowledge as they grow and getting to know more about renewable energy and its importance in our lives. The African Power Platform (APP) has launched the Africa Power Access Accelerator (APAA) , a program designed to support power projects in Africa on preparation, structuring and financing. The first application window is now open, with submission deadline on the 31st March 2019 . Full details, including a presentation and application form can be found here . This article presents vital lessons that have been learned from engaging and enrolling female entrepreneurs into an energy access project, in Kenya and Tanzania which is providing business and technology training and mentorship and support to access financing and market opportunities. Although the aim is to work with female entrepreneurs, projects should consider engaging both women and men given the nature of how small family businesses are owned and operate. This will enhance harmony in the families and but also ensuring that women are able to make sound decisions for the business together with their partners. Men should also be involved as the energy products value chain involves both women and men for successful delivery of the products to the markets. It is important for project implementers to have open mind to learn and adjust their approach in response to the situation in the target areas. The approach may be different from assumptions made during the design phase, but the adjustment will enable projects to have the greatest impact on the beneficiaries it supports whilst improving the assumptions for the design of future projects. Jane Kioko’s first job as a marketer in a solar company inspired her to establish her own business, Silver Investments, in January 2016, selling solar products to remote off-grid villages. Based in Tala, Machakos County in Eastern Kenya, Jane sells lamps, solar panels, converters and batteries to homes, businesses and institutions, some as far as 20 kilometres from her shop. An entrepreneur with a passion for improving lives with solar products, has set her eyes on expanding her business and bring solar products to remote communities, thanks to mentorship from Energy 4 Impact’s Women Integration into Renewable Energy (WIRE) Value Chains project. 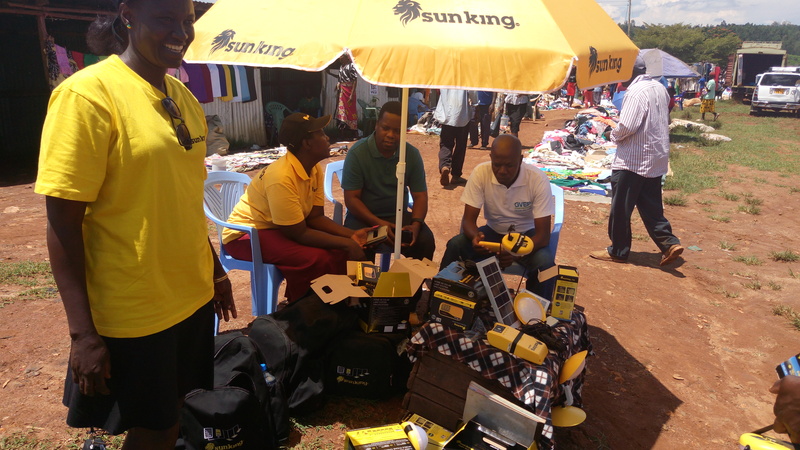 I bought my Sunking Home 60 Solar Lamp System this week in Siaya, Kenya. I am very excited and looking forward to enjoying the services of this pay-as-you-go enabled solar kit which comes with three lights and options to charge cell phones and my small portable radio. The unit comes with 6 Watts solar polycrystalline panel, control panel with 5.5V USB and 12V DC power output, 2 overhead lamps with switch, and a radio. The control panel has a display with two indicators 1) for the battery status: to indicate the remaining battery power and 2) solar charge indicator: to indicate effectiveness of the charging by the solar panel in a scale of 1-5 and this helps user to position the panel for maximum performance. The radio is a portable FM radio with internal 650 mAh battery that is recharged via USB. It operates in two modes FM radio and MP3 music player. It can read micro SD card and with an inbuilt display it can show the FM stations in radio mode and songs number in music mode. I am impressed with this radio’s clear sound and decent bass. This unit will complement my power supply for lighting and phone charging needs at my home. We will continue to have better lighting even during the periods of blackout. The purchasing – which included the vendors getting my personal data and activating my unit took about 10 minutes only. I did my first payment and My Sunking unit was activated immediately through the vendors mobile phone. I made down payment and was ready to use the sytem. I will continue to observe performance of this unit and will update you in the coming weeks.